Wu Guanzhong (1919-2010) dedicated his entire life to exploring the modernisation of Chinese painting and the nationalisation of oil painting. He opened up a path for a modern taste that brought Chinese and Western, past and present, together. Wu was not only a renowned 20th century painter, but also an eminent art theorist and educator. He believed that artistic works should not depart from emotional exchange with people, so he wished to create works that suited both refined and popular taste. Wu Guanzhong visited Hong Kong frequently for exhibitions and art activities. He had a high opinion of Hong Kong’s cultural setting and liked the fair systems of the city, which was also a meeting point of East and West. Wu always trusted the Hong Kong Museum of Art, commending its curatorial approach to his art. He said, “It can interpret and comprehend my artistic exploration.” Wu and his family have made many donations to the Hong Kong Museum of Art over the years, resulting in a vast and comprehensive collection of over 450 works, including the last paintings completed before his death. The Museum will showcase the master’s donated works in the new “Wu Guanzhong Art Gallery”, scheduled to open in 2019. Educational and promotional activities will also be organised to promote Wu Guanzhong’s art and his great spirit of selfless contribution. Szeto Yuen-kit received his BA (Art Education) from Warwick University, MPhil (Chinese Art History) from Hong Kong University, and Diploma in Museum Studies from Sydney University. Since 1986, he has been Curator of the Hong Kong Museum of Art responsible for the Chinese Painting and Calligraphy Department, including the Xubaizhai, Chih Lo Lou and Wu Guanzhong collections. 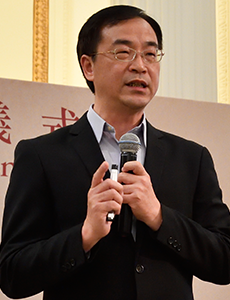 His expertise is in Ming, Qing and 20th century Chinese paintings, as well as in subjects related to Chinese art education. He has published many academic articles and delivered lectures in universities and educational institutes in Hong Kong and mainland China. He is an academic member of the Wu Guanzhong Research Centre (Tsinghua University) and Researcher of the Beijing Painting Academy. Important exhibitions organised by him include The Pride of China: Masterpieces from the Palace Museum, Ming and Qing paintings from the Liaoning Provincial Museum, Paintings from the Shanghai Museum and Song, Yuan and Ming paintings from the Osaka Art Museum. He has also organised many solo exhibitions of 20th century masters including Qi Baishi, Li Keran, Lin Fengmian, Huang Yongyu, Pan Tianshou, Feng Zikai and Wu Guanzhong. From 2004-06, he broadcast a series of talks on Chinese art appreciation on Radio Television Hong Kong.